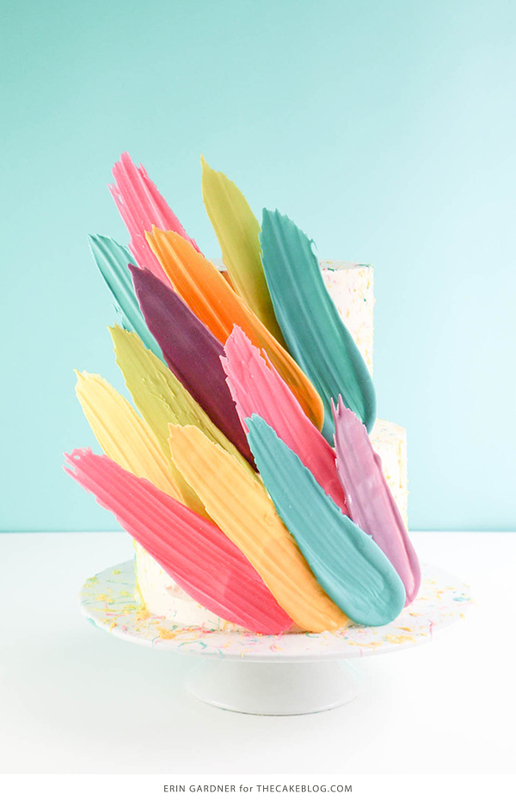 Brushstroke Cake – how to make a Kalabasa inspired feather cake using candy melts and everyday tools. A new tutorial by our contributor, Erin Gardner! 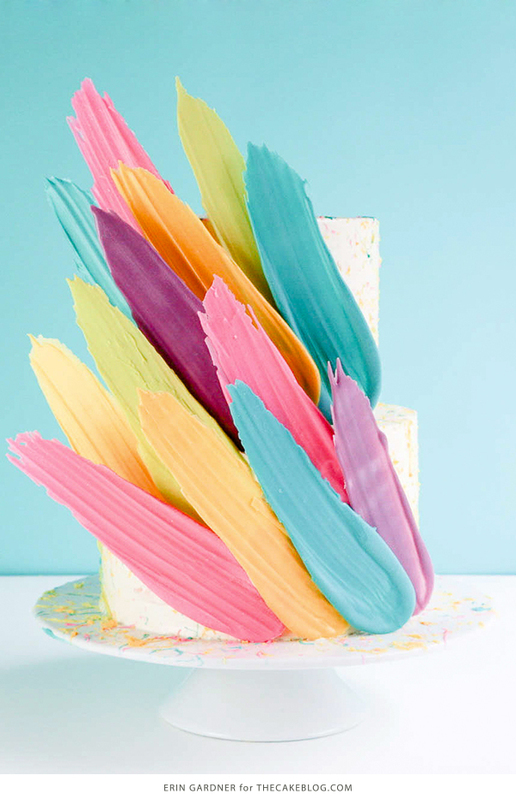 Russian cake designer Kalabasa recently ignited the latest cake trend with her Instagram-famous brushstroke cakes. 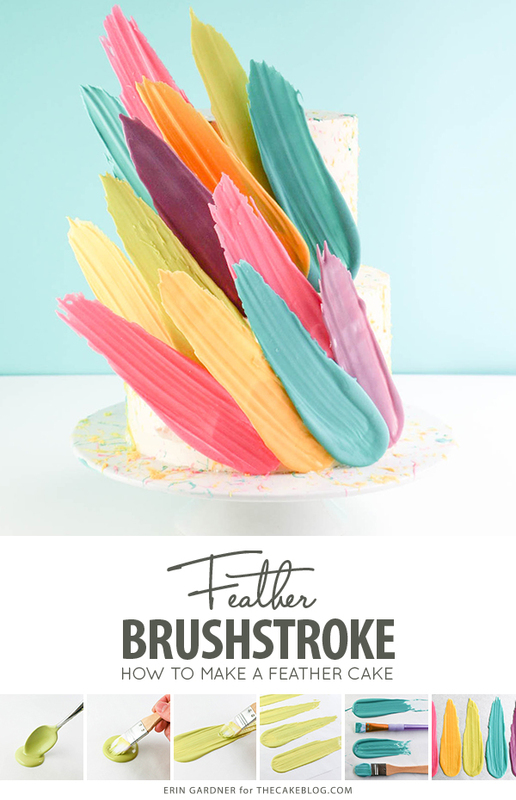 If you want to take a peek at her work for yourself, don’t search by the term “brushstroke cake”. That seems to be what US cakers have decided to call this look. She tags them as #kalabasa_feathers_cake. 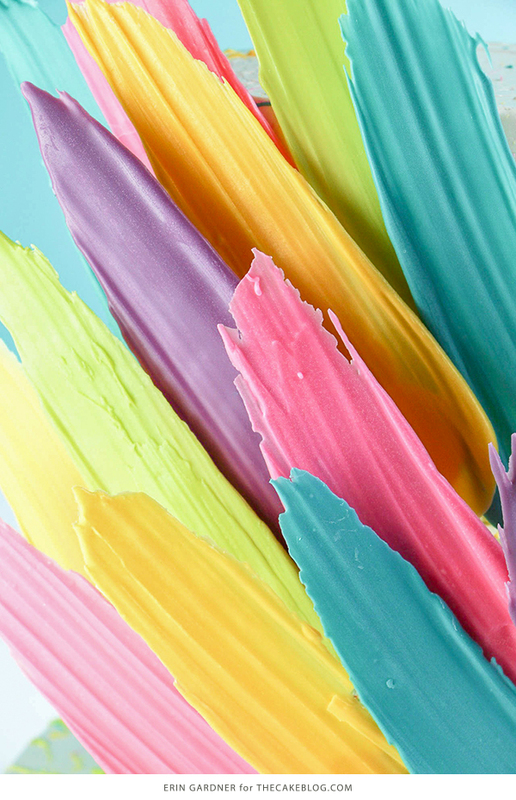 Whether you call them brushstrokes or feathers, either way, they’re gorgeous! Use chocolate brushstrokes to add drama to a simple single tier or multi-tiered cake, or make smaller ones to use as cupcake toppers. These stunning modern chocolate decorations make a statement on their own, but the addition of a little “ chocolate splatter” on the surface of the cake adds to the paint-inspired fun. 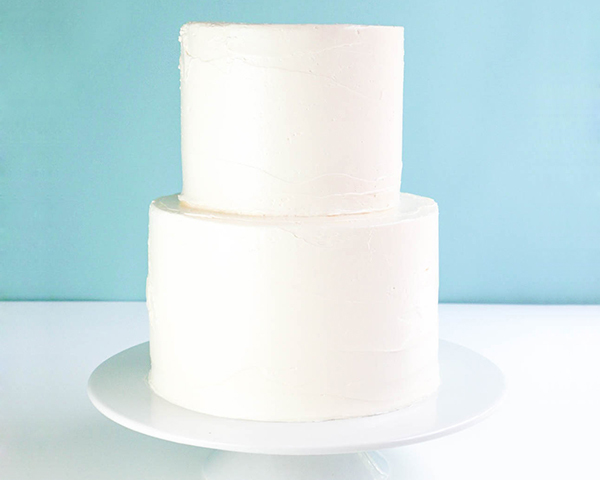 This style of cake would make for a bold, modern wedding cake in pastel or muted hues. 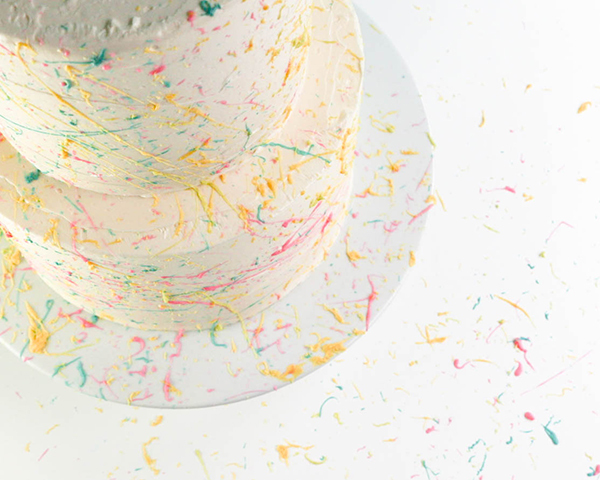 In brights it would make a perfect birthday cake for kids of all ages. 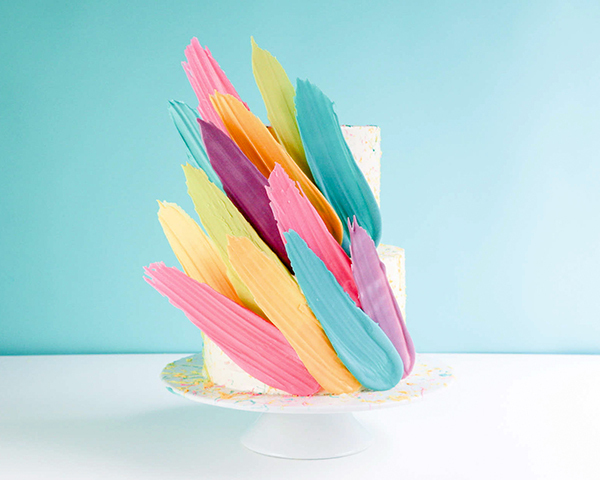 While researching this brushstroke cake trend, I decided that I preferred the brush strokes with a rounded base end. Something about the rounded edge helps the design look more purposeful and less like a bunch of random smears. To achieve the look, I used a pair of sharp scissors to round the edges of an inexpensive paint brush. 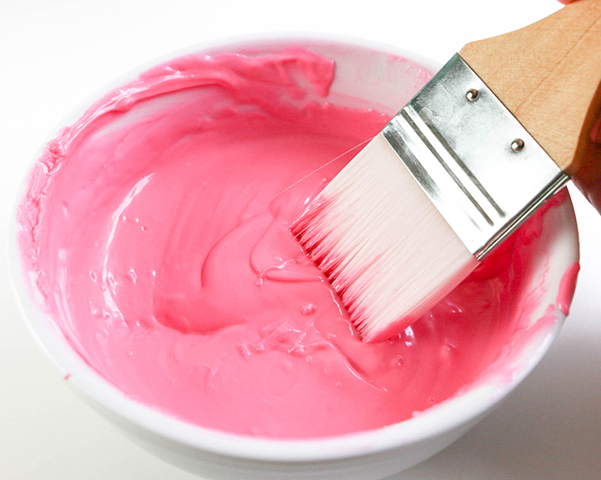 Slightly dampen the bristles of your paint brush before cutting them. The wet bristles will stay clumped together, making it easier to cut them into your desired shape. Melt one of the colors of coating chocolate in a small heatproof bowl. Pour a spoonful of the melted chocolate onto a piece of parchment paper. 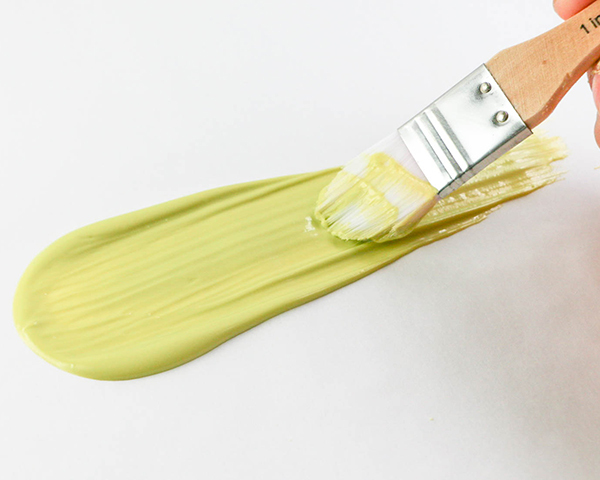 The diameter of your puddle should be slightly larger than the width of your paint brush. Use the brush with the rounded edge to gently, but quickly spread the chocolate out across the parchment paper. 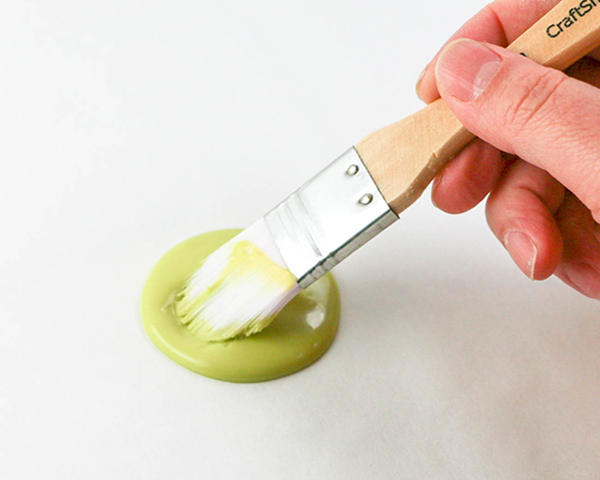 Start the brush just within the outer edge of the puddle, so that your brushstroke is left with a pretty, rounded base. Go over the brushstroke as needed to achieve your desired shape. 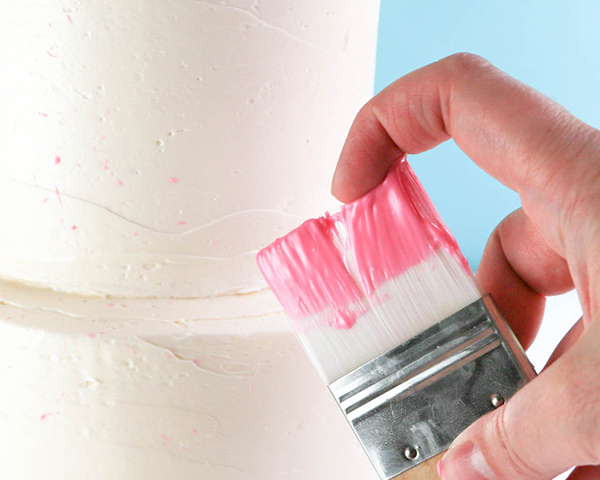 The length of your finished brushstroke should be longer than the height of a single tier of your cake. Brushstrokes should be thin, but not so thin that you see the parchment paper through it. 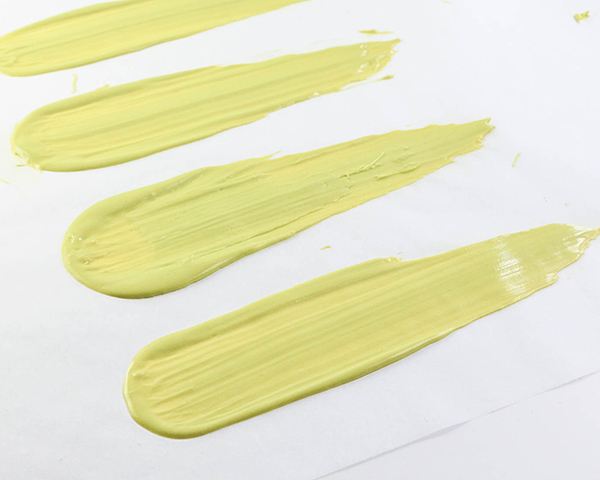 If you make your brushstroke too thin, add a little more melted chocolate and pull the brush through it again. 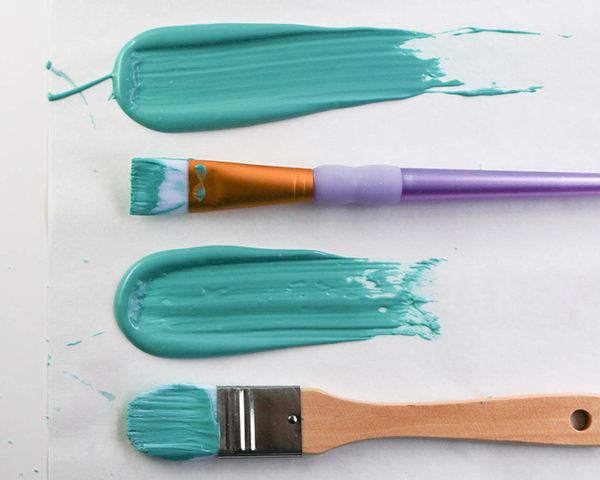 Repeat to make 3-4 brushstrokes in each color. Set them all aside to completely harden before using, about 10 minutes. I ended up using only 13 brushstrokes total, but I made many more than that. Having extra is helpful in case one breaks while you’re trying to place it on the cake. With this kind of free-form design, you can never really tell how many you’ll end up using until you decorate the cake. 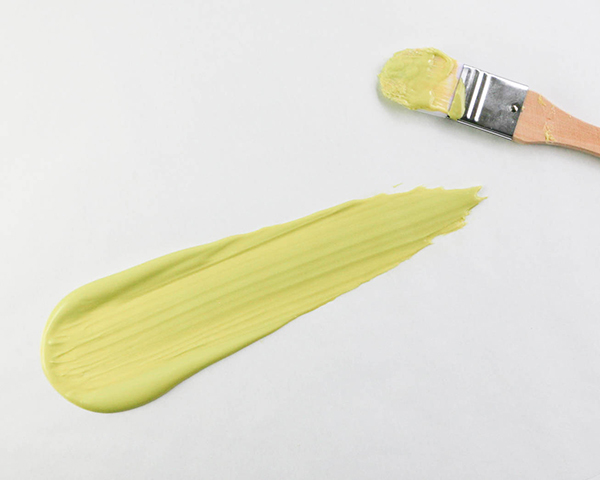 Brushstrokes that don’t get used can be melted back down and saved for other projects. Place your cake on an easy to clean surface, on newspapers, or inside an open box turned on its side. 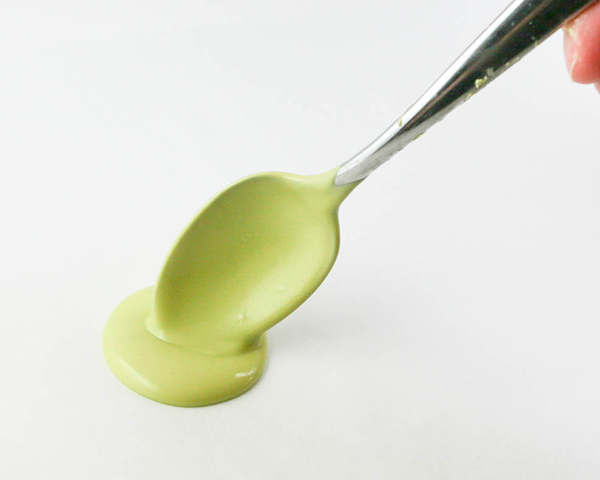 Dip the uncut brush into one of the colors of melted coating chocolate. 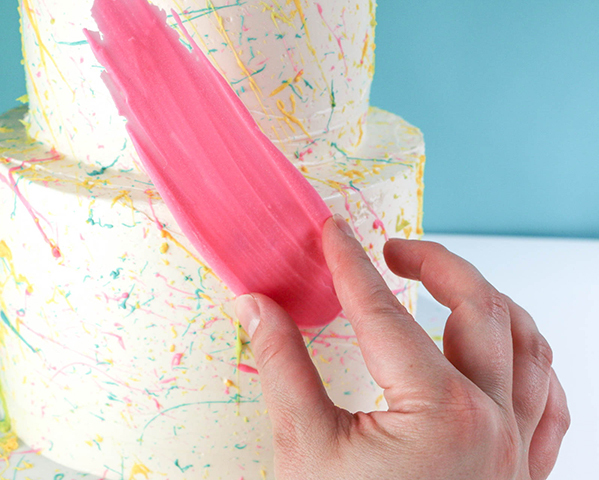 Flick the bristles of the brush to splatter the surface of the cake. Repeat with the other colors. Lift the brushstrokes from the parchment paper, handling them by the fat end to avoid breaking the tail. 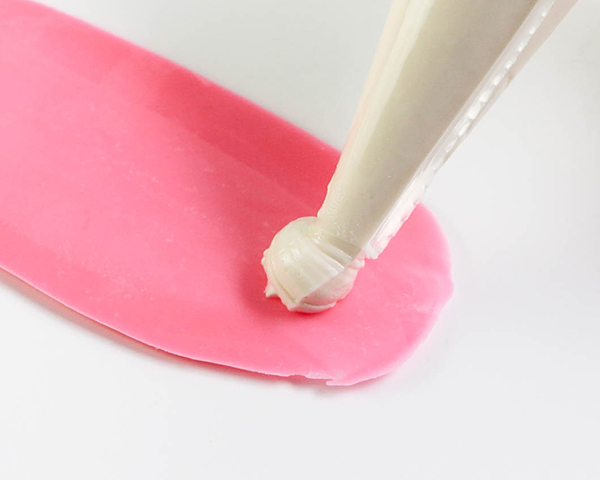 Use an offset spatula or a small knife to help lift them from the paper if you need to. 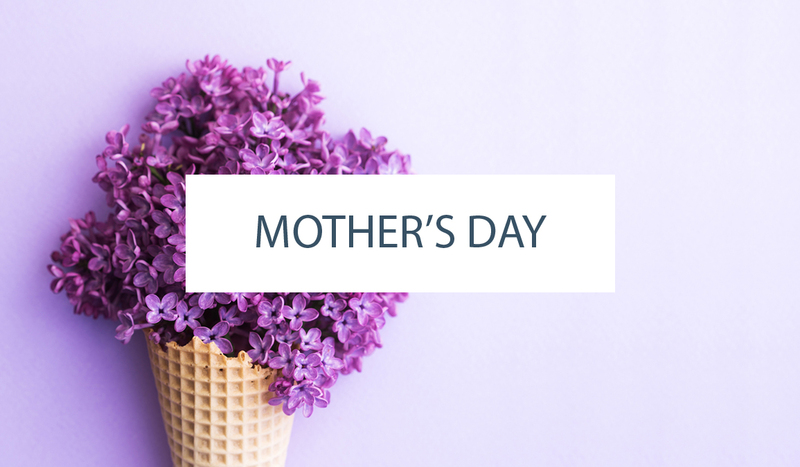 Fill a piping bag with about a cup of the leftover buttercream. 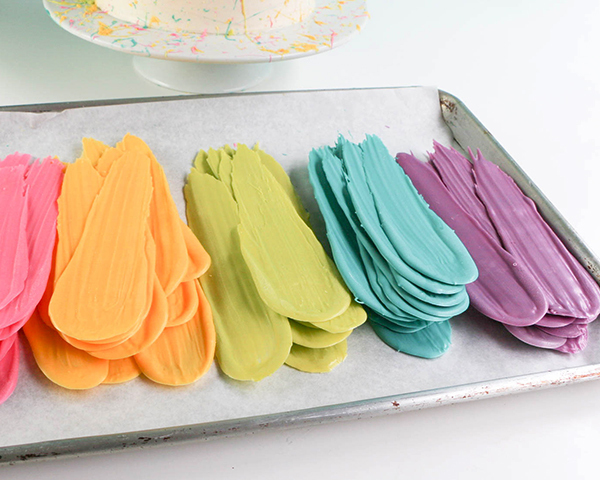 Flip a brushstroke over and pipe a dime-sized dollop of buttercream onto the fat end of the brushstroke. I found it easiest to add the first brushstroke to the bottom tier of the cake with the tail sticking up over the top edge of the cake. I added a few more at that level, then filled in with more in front of those brushstrokes. Place that row so that the bottom rounded edge sits flat against the cake plate. Finish the design by filling in the top tier in the same way. 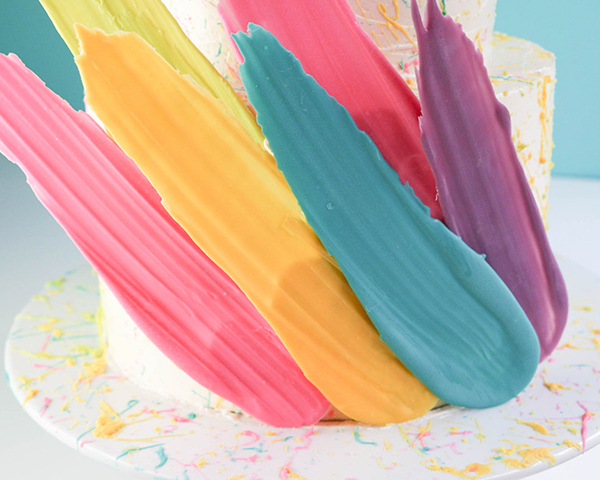 Add the first layer of brushstrokes with their tails sticking up over the top of the cake. 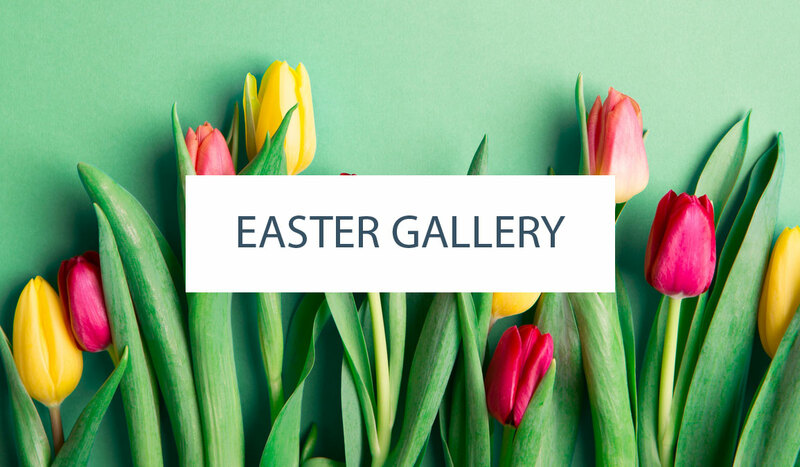 Place the next row of brushstrokes so that the rounded edges are resting on top of the tier below. 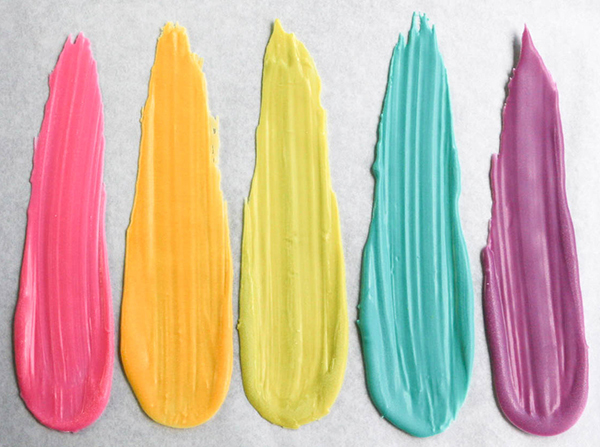 Erin used Wilton candy melts, which will be more stable than a pure white chocolate. I’ve never used the Cadbury melts, but perhaps that was the difference. This is so cool. What a beautiful version of this technique. You break it down into such simple doable steps. What a fun and colorful cake! I love how you break down the steps – it looked easy to do! How do I store the prepared chocolate strokes a few days in advance? Do I add them to the cake right away and refrigerate or add them on the day of use? Also does it hold up overnight in a fridge once prepared?